Special TOVP Presentation - October 5, 2014 ~ The Toronto Hare Krishna Temple! 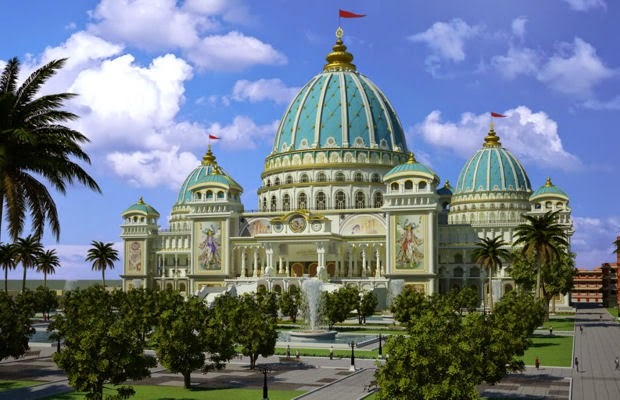 In Sri Dham Mayapur, the largest temple in the world is presently being erected, the Sri Mayapur Chandrodaya Mandir – Temple of the Vedic Planetarium or “TOVP” for short. Our Founder Acharya, Srila Prabhupada stated, “Now you all together make this Vedic Planetarium very nice, so that people will come and see. From the description in the Srimad Bhagavatam you prepare this Vedic Planetarium. My idea is to attract people of the whole world to Mayapur” Thus this project is a fulfillment of Srila Prabhupada’s wish and devotees from all over the world are coming together to help in the construction of what has been dubbed the “temple for the next millennium”. Earlier this year, the TOVP Canada team was formed in order to have a coordinated effort to participate and collect funds for selected key elements of the TOVP project. Our initial collections from Canada will go towards the purchase of a “lightning arrester system” which will protect the temple and in particular the central dome from lightning strikes. The inaugural event for TOVP Canada is a special visit of H.G. Radha Jivana Prabhu on the weekend of October 4th and 5th with a special discourse at ISKCON Toronto’s Sunday Feast on October 5th. Radha Jivana Prabhu comes from a well established Vaishnava family in Rajasthan. He was educated in Doon School and graduated from St. Xavier’s College Mumbai, after which he joined ISKCON in Shri Dham Mayapur in 1978. He served as the Vice President of Calcutta temple, director of BBT in Mayapur and a member of the administrative council in India. After serving in Mayapur for 14 years he shifted to Alachua, Florida, a large devotee community in America. Over the last two decades he has become a successful businessman who also provides employment for numerous devotees. Radha Jivana Prabhu is a dedicated disciple of H.H. 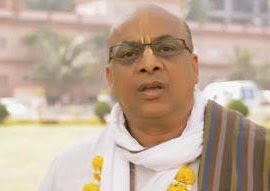 Tamal Krishna Goswami and actively supports a preaching center in Guanzao China. He has been a major donor in the construction of ISKCON Dwaraka, Rajkot as well as projects in Mayapur. Currently he is active in building the beautiful Las Vegas ISKCON temple. During the last decade, Radha Jivana Prabhu has been involved in the protection of Brajdham Vrindavan where he was actively engaged in fighting the mining of the sacred hills of Braj where Krishna’s past times took place. After a great deal of effort he succeeded by convincing the government to declare the hills of Braj as protected forest land. He also financed and organized residents of Braj to perform Harinam kirtan in their villages every morning and in this way was able to influence thousands of villagers in and around Braj to participate in Lord Chaitanya’s sankirtan movement. For the last few years Radha Jivana Prabhu has headed a team of devotees to undertake the challenging service of persuading the government to clean the Yamuna River by organizing major public demonstrations throughout Braj. Last year he even marched to Delhi with fifty thousand people to highlight the plight of Yamuna River. Most recently he has been asked by the GBC to take up the challenging work of raising $50 million in funds for the construction of the TOVP and is coming to present this “Once in a Millennium” opportunity to devotees in the Greater Toronto Area.